Fast n furious 2- minute nicely burnt flat rice vermicelli with crunchy beansprouts & green thing, succulent prawns, maybe sliced Chinese sausages, almost raw cockles, &/or scrambled chicken eggs in top-secret greasy garlicky mix over a usually noisy, dark & sinisterly piping hot Chinaman wok. A masterful creation ... complete with multiple whiffs of unforgettable aroma served in a plate accompanied by only chomping clattering chopsticks. You got da idea ? Fabulous color & gluttony splendor ! Asia Cafe 's ( Subang Jaya, PJ ) stall no 5. Atypical but just one of many Xcellent serves you can find throughout the Klang Valley. This one's a clear winner. Steven's Corner, Nam Chun in Lucky Gardens Bangsar KL. Perfectly charred overbig longish & slippery noodles in crackling lard. From da xtra bright fluorescent lit mostly unequally floored friendly neighborhood corner shoplot/open-air shack in uptown/downtown fringes. Proudly from Team Big Fry... da dark, sultry and still enviously controversial Big Noodles. from the Damansara Hokkian Mee restaurant in DU, PJ. wok-hei ugwug ! , Heng Kee Sea park PJ. CKT & Hokkian Fried , two of the most simply sophisticated & gluttoneously killer Malaysian Chinese Culinary Greats ever to grace our shores, are deliciously deceptive but deservingly satisfying, each having extraordinary dangerous looks, colors & incomparable aromas...and a little scary to the novice up-&-coming underweight Gourmet. jooorrrrrr... supposed to eat the hokkien mee tonight.. then my friend ffk me. awww!!! looking at these pictures.. drowning me into desperate moments of wanting TO EAT IT!!!! aiyoh, all the kerang are calling out my name lor. I lurve CKT!! Must check out the Lucky Garden one. Have you tried the KL one? WMW recommended another tai lok mean in Paramount. They say the 222 one not nice liua. ...and the green thing in the char queh teow is called 9 choy i think. Dunno the name for it in English. 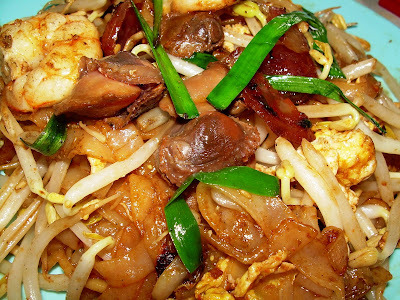 i suppose this hokkien fried mee is hokkien char to us penangites? and you mentioned it is available in a hokkien mee restaurant - to us penangities hokkien mee is prawn mee (the soupy one... with prawn stock soup). all these confusion of the names for food! why we no use same name one? Oh...yumyumyum...both ckt and hokkien noodle also my favourite. Best laden with lots of lard. 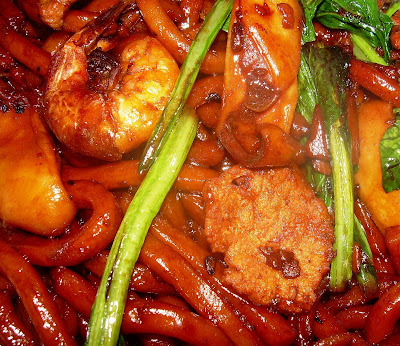 I love the DU Hokkien mee!!! 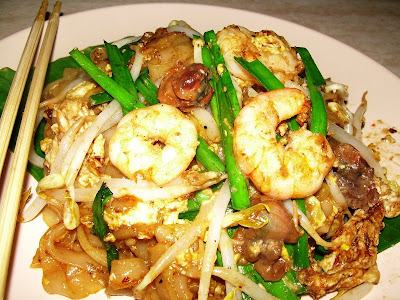 Aiyoo....and the char kuey teow....i wan tambah "si ham"
yummmmy, my favourites. see ham is a must, for CKT and curry mee!!! 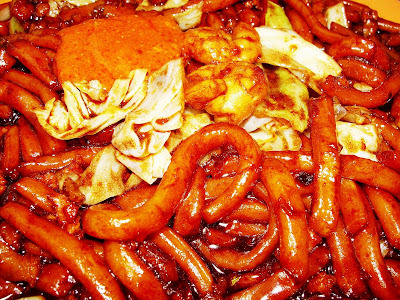 where is this damansara hokkien mee place? the 222 one, is it the corner or the intermediate one? goodness!!!! have you try ckt with ducky eggs? any idea where can have that? I still prefer Penang CKT!!! Die also must eat. Teckiee...not Paramount but SEA Park, the one team BSG tried, which is my fave. As for CKT, it's stall No. 5 in Asiacafe, Subang. WMW requested us sometime back to compare Asia Cafe and Stevens. who ask u to be greedy eat in Zen for 5 hrs then all else kanot oredi ? Even Nirvana u missed my goodness ! yes WMW clarified down there oredi. Tks for green thing called 9 haha. U like meh this big noodle? Dun think 2 scary big ah ? Cheese is like your smile so slim and nice isn't it ? So how this black big mee? kanot, just like girls, must be different but same ! V have them ducky in our palms when r u ready Goddess ? technically best with chilled beer ! & voracious gluttons like him, U and Us ! aiyo another CKT addict, those Penang Kia ! Welcome home to da Really Wet Tropics ! slurrrp slurrp slllllurrrrppp cruel cruel unkind us...sorry ! do u know lard has no trans fat! ohhh...dat murni ah. I always drive past that mamak stall and it is forever crazily packed wiv ppl!!! Must learn their business strategies :) Anyway, thanks alot for the rekomendation. Will brave the human traffic to hav a luscious bowl of mouse tails. Never mind la....eat and enjoy now, suffer later lor..hehe. I rarely eat ckt in Pg. Now that i'm in KL, kinda miss them. ok tks lets eat ! after eat do tell us all about the mouses ! next time Me first ! no escape ! kacang? means got small hard sound one ah ? bsg, wmw: LOL! ahh ok.. 2 place to go next time. Haven eaten dai lok min for so long.. bsg.. my fav lehh..
i can't believe no one mentioned the hokkien mee at cheow yang SS2. That is the benchmark. We have somehow missed that so V will keep that in mind.